Unfortunately, some animals cannot be rehomed due to old age or ill-health and need sponsorship to care for their individual needs. 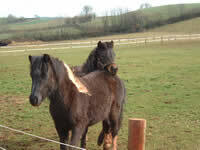 Sponsor a pony or goat and receive a certificate and photo. This comprises of a monthly donation of £5 payable by Direct Debit. If this adoption is intended as a gift, please include the name & address (if it is different to the payment name & address) to include on the animal's certificate . Currently we are unable to offer an online payment service. Cheques made payable to "Rainbow Valley Animal Sanctuary" or contact us for bank details. A list of available animals can be found from the Ponies and Goats page. Find out how the money is spent.